at the Desborough Suite, Maidenhead Town Hall. 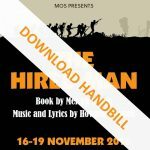 Set in Cumbria from 1898 to the 1920s, THE HIRED MAN is the story of the Tallentire family and their village community, who work on the land and in the mines, and hope to survive the WW1 battlefields. This powerful and uplifting musical is a collaboration between two of the country’s best-known writers and broadcasters. Melvyn Bragg based the story on his grandparents’ lives, and Howard Goodall’s music perfectly matches it, being inspired by English folk and choral music. A memorable experience awaits cast members and audiences alike.